Hands-free dual flush commode system includes an automatic flush valve conversion kit for Sloan urinals. Manual flush works when AA batteries are dead. Quick and easy installation, rugged chrome solid metal construction. ADA compliant. Comes with push button conversion kit. Adjustable sensor angle. 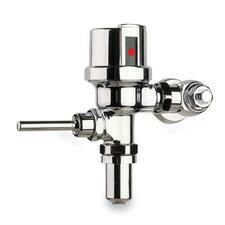 Dual flush is listed by greenspec and is the only retrofit flush valve available today designated a green product. 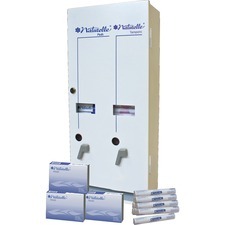 All-white metal dual dispenser holds 12 sanitary napkins and 19 tampons and features a separate locking coin box. Dispenser comes complete with two 25 cent coin mechanisms and a Convenience Refill pack. Refill pack includes 50 Naturelle Contoured Napkins and 50 Naturelle Tampons with regular absorbency. Naturelle Tampons come with 100 percent flushable cardboard applicator. Dispenser has a white enamel finish. Convenience Pack is designed for use in the Impact Dual Vendor Hygiene Dispenser. 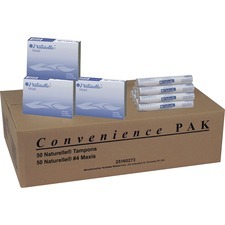 Pack includes 50 Naturelle Napkins and 50 Naturelle Tampons. Individually wrapped tampons feature a cardboard applicator and regular absorbency. Sanitary maxi pads feature a contoured shape, individual wrapper, and a multiple channel system to draw wetness to the center of the pad, preventing lateral leakages. Transparent dispenser stores and dispenses half-folded toilet seat covers for a more sanitary restroom. Capacity is two half-fold sleeves of toilet covers. 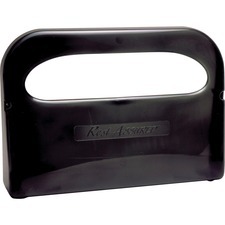 Durable, plastic dispenser is designed to dispense one at a time through its wide opening. Design matches most other restroom dispensers for a coordinated look. Individually wrapped tampons come in a special vending tube to fit neatly in vending machines to offer women convenience away from home. Users will also feel comforted with the well-known brand name Tampax. 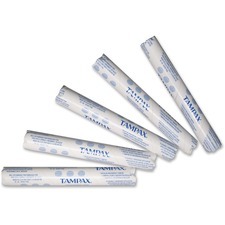 Tampon sleeves are made of cardboard so they are flushable and safe for toilets. The string is sewn into the tampon so you won't have to worry about the hassle of separation. Bulk size makes sure you stay supplied. 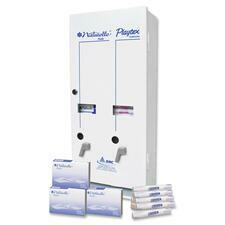 Sanitary napkins are packaged to refill the Impact Dual Vendor Hygiene Dispenser. Naturelle Plus Maxi Pads offer a contoured shape, protective wings, an individual wrapper and multiple channel system to draw wetness to the center of the pad, preventing lateral leakages. All-white metal dual dispenser holds 12 sanitary napkins and 19 tampons and features a separate locking coin box. 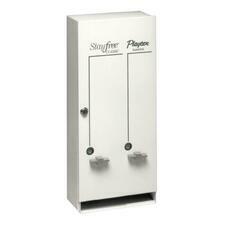 Dispenser features two 25 cent coin mechanisms and a white enamel finish. 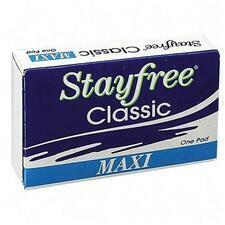 Use Stayfree sanitary napkins with wings and odor neutralizer for maximum protection.